You can keep your tortoises, boobys, sea lions and sharks: according to many respected biologists, the most remarkable animal in all of Galapagos is the mild-mannered marine iguana. Their argument is this: while finches, giant tortoises, herons, penguins and sea lions are found all over the world, only Galapagos has a species of aquatic lizard that dines on algae. 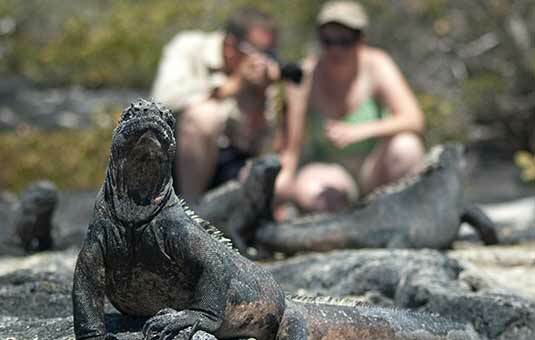 Small marine iguanas can be eaten by Galapagos hawks, snakes, rodents and introduced species such as cats and dogs. When fully grown, however, they have no naturally occurring predators in their habitats, a fact which makes them largely indifferent to humans and any other intruders for that matter. This makes them a perpetual favourite with kids, photographers and other visitors to the islands. A day in the life of a marine iguana is pretty simple. They sleep together in clumps to conserve warmth, or occasionally in crevasses that are somewhat protected from the cold. After a few hours of basking in the sun to get their body temperatures up, they'll head out to feed. Marine Iguanas eat algae that grow underwater on rocks near the shore. Larger male iguanas are better swimmers and capable of going out farther and deeper, some up to 15 feet (4-5 meters). They dive and use their sharp claws to grip the slippery rocks while they gnaw off mouthfuls of tasty algae. Like sea lions, marine iguanas have a special pigment in their blood which allows it to hold more oxygen: they can stay down as long as an hour without needing to resurface. Back to shore and more basking, as the mid-day heat aids their digestion. The breeding season is from December to April, and the eggs are laid in holes in the sand. During the mating season, it is not uncommon to see males battling over turf, charging others and "locking horns" in a lizard-y sort of way. Once the eggs are laid, that's it: marine iguanas believe in tough love for their hatchlings and do not protect their young. It is believed by scientists that the marine iguanas are descended from iguanas that floated out to the islands from the continent on logs or clumps of vegetation eons ago. They then adapted to the harsh life on the islands. Galapagos' land iguanas are believed to be descended from some second arrival, some time later: the marine iguanas are more adapted to island life. The two species can interbreed, and there are some hybrids, but these offspring do not live long and are sterile. This tells researchers that the two species are related, but not too closely. Charles Darwin was a bit unimpressed with the iguanas: "It is a hideous-looking creature, of a dirty black colour, stupid, and sluggish in its movements." Darwin was astounded that the lizard could swim and even more surprised that if thrown in the water, it would consistently return to the place from which it had been thrown, showing no fear of people. The crew did some unscientific experiments on the iguanas: one crewman submerged one for an hour and it was still alive and active when brought up. Marine Iguanas are found everywhere in the islands: you'll find them on just about every coast. If you go to Española Island, be sure to look for the red-and-green colored ones known as the "Christmas Iguanas" and believed by some scientists to be a separate subspecies.